The McPin Foundation is committed to using research to improve the mental health of people in communities everywhere. We champion the role of lived experience expertise in all aspects of mental health research. We employ and work with people with mental health problems to provide advice on research and deliver research projects. We fund studentships, supporting young researchers to develop a research career in mental health. We research topics that matter most to our supporters – employment, stigma, personalised support, wellbeing, young people’s mental health and new models of care including peer support. On Monday we begin a week of activity aimed at highlighting methods of Patient and Public Involvement (PPI) in mental health research. We will be publishing a number of new papers and contributions from our team during the week exploring how we work and the challenges it poses. They draw on our experience of trying to put our principles into practice and what we have learnt from our friends and collaborators. What we have learnt over the past 3 years is that PPI is not easy but it is important in driving forward quality mental health research. What we have learnt over the past 3 years is that PPI is not easy but it is important in driving forward quality mental health research. Sharing the guide we have developed for staff and the people we work with on our approach to PPI and the language we use. We hope that it might also be helpful for others. It is not a definitive statement but more of a snapshot of where our thinking and practice has reached. Update you can now read the slides and Vanessa’s blog about the process of creating them. Launching our methods workshop series with the first on ‘Integrating lived experience expertise into mental health research teams’ on Wednesday 30th November. Update The slides the presenters used are available here, our policy manager Ian blogged about his initial reactions, and a fuller summary is available to download. Publishing blogs by our staff discussing their personal take on the issues raised throughout the week. We hope you can contribute to the discussion. 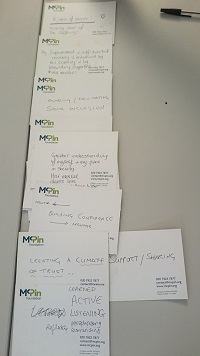 Do check back on our website (www.mcpin.org) for launched resources and follow us on Twitter (@McPinFoundation) or our Facebook page where we will be talking about this work.